Thanksgiving is next week... can you believe it!?! Are some of you dreading all the cooking...or looking for a simpler way to serve up a feast? 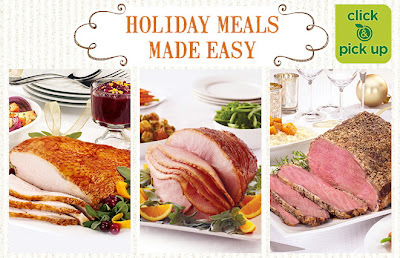 Fresh & Easy's Holiday Meals Made Simple is a smart and yummy solution! You can order a Turkey, Spiral Ham or Beef Rib Roast Dinner (feeds 6-8) online that comes with 3-4 sides and a pumpkin pie and pick it up at your local store on November 20th, 21st, or 22nd. The meals are affordable and give you several side options to choose from not to mention give you more time for all the things that really matter like spending time with family. It's also an excellent option for work parties! You must place your order by midnight Thursday, November 15th to have it ready for pickup at your local store to enjoy with your family and friends next week. I'm really excited to try... this is perfect for busy moms. Will you be preparing Thanksgiving dinner? Visiting friends? Having a Thanksgiving party at work? *Fresh & Easy sent me a gift card to try their Holiday Meals Made Simple. No other compensation given. Great idea. Hope you have a great Thanksgiving. I love this!!! What a wonderful idea!